"I've never gone from 100% hype to totally deflated so fast" Uh oh! Something is afoot in Valve-land with their now-in-public-beta Artifact digital card game. The NDAs are lifted and people are speaking their mind. Not about the game play or that some totally broken card/combo, but about Valve's audacity to actually charge players to play the game. A tough pill to swallow in a universe of "free 2 play" competitors. As the veil of the NDA came down and Valve released an updated FAQ concerns started to flood in about the "Artifact paywall". Essentially; everyone is upset that Valve plans to charge players to buy tickets to get into common events. Specifically is the requirement to buy "tickets" along with the packs to participate in draft modes. For those unfamiliar with drafts within card games; players buy a a set number of card packs and then spend turns picking cards (drafting) from those packs to play a game. In real life paper card games; this means you get to keep the cards you draft (because once the packs are open there is no putting the cards back). Draft modes where players keep cards are often called "keeper drafts". With digital games there is the ability to have phantom drafts where players do not keep the cards. Often times these phantom draft modes allow "free 2 play" games to give their "free" players a way to enjoy draft. Alternately, some games like Magic the Gathering Arena, allow "free" players to acquire free credits that can be redeemed for a draft. Valve has decided to eschew the "free entry" model for their game modes and are instead charging players a number of tickets to participate in the game modes. This includes keeper draft modes; players have to pay for tickets and packs. Valve's reasoning for the tickets is due to the events rewarding tickets and packs (the better you do the more you get). Also for phantom draft modes the requirement to pay for a ticket (or use one you earned) also helps solve the issues of 100% free drafts where players quit after a poor draft (i.e. they didn't get good cards). There is no way to play Artifact for free. Players have to buy the game ($20) and have to buy tickets to play in modes that reward new cards. There is no method where players can grind for free cards just by playing the game. Caveat; if you are a really good player you can go "infinite" whereby you always win the events and thus receive more rewards than needed to join another event (and thus after your first purchase you never have to buy into an event again). This is a distinct difference from the other major players in the digital CCG market. Specifically both Hearthstone and MtG Arena offer completely free methods to enter their draft modes. Combined with the feedback from the Artifact beta testers that draft is the best way to experience Artifact it sets the stage for the hype to die. Essentially lots of folks assumed Artifact was just going to be a free 2 play game. On one hand I can see where players would assume the game would be free becaus Artifact is based on DOTA2 and DOTA2 is 100% free 2 play. On the other hand I can point to the fact that Valve has always stated that they intended Artifact to replicate a real life card game where players can buy, trade, and sell cards just like they were real cards. Thus it should be no surprise that Valve was going to charge an entry fee for events since the rewards (cards) have tangible real world value. Another concern was that the hero cards in starter decks were also in packs which means they are dead cards with no value (everyone gets the starter decks and thus would never need to trade/buy a copy). 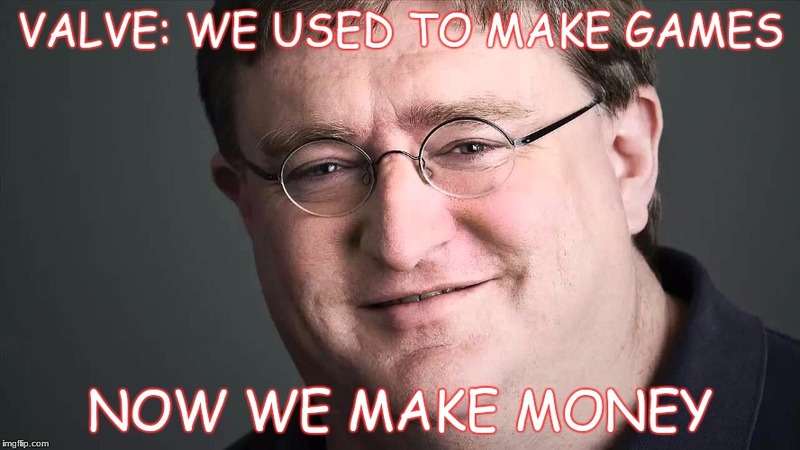 Also Valve clarified they will be taking a 15% cut of market sales which many felt was a high take. All of this has cascaded in a torrent of "Artifact is doomed" and "Artifact's paywall is stupid" type posts across the Internet. Those sort of posts are my area of expertise as I am usually the pundit screaming the loudest about this sort of thing. I love me a good doom and gloom post! However, all I can do is sit back and wonder what the heck these folks expected. More importantly I struggle with not giving Valve the benefit of the doubt. There were many people, myself included, who doubted that a 100% free 2 play DOTA2 would ever work or that a bunch of silly community-created content could drive a robust economy in Team Fortress 2 or that players would drop hundreds of dollars on barely recognizable skins in Counter Strike GO. Valve has made all of these "different" models work in their major games and for the most part executed them in the face of "that'll never work" punditry. 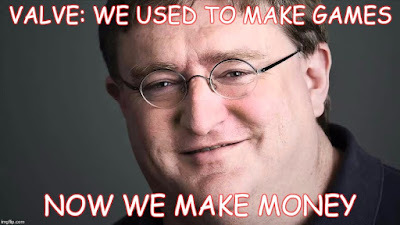 The bottom line is that Valve has never looked at the market and said "we're going to do what everyone else is doing". They have always forged their own path. Some things have worked; some have not. Valve has taken a calculation with Artifact that there is an audience out there that wants a close-to-paper recreation of a card game in digital form. Personally I am one of those players. I want to be able to buy, sell, and trade my cards. I want to know that other players have bought into the game. I am done putting credit cards into slot machines hoping the magical number overlords deem me worthy of the specific card I need. I am done with dusting and wildcards. If there is some stupid low power common card I want; let me buy it for a few pennies. If there is a high power rare for a top tier deck, let me make the decision to keep hitting the slot machine for it or just take that money and buy it out right from the community (or better yet, let me trade up to it without having to expunge the cards from the community pool). All of this to say; KEEP GOING VALVE; I'M WITH YOU! 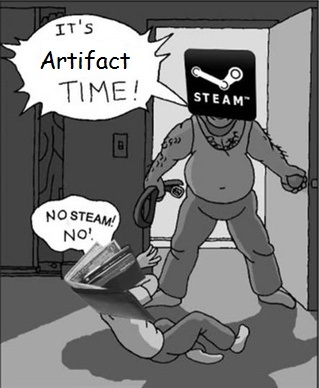 Contrary to the "I'm canceling my pre-order"; I am taking this opportunity to pre-order Artifact. Also shortly after all this hub-bub; Valve mic-dropped a beta update invalidating many of the concerns. In summary; excess cards can be recycled into event tickets. This means there will be a minimum value for all cards (i.e. at some point it is better to recycle than to sell on the market). It is a simple and brilliant solution and while it brings in a form of "dusting" it is acceptable for the problem it is solving (worthless cards and a race to the bottom for card prices in the market). In addition to the recycling of cards they are prioritizing a couple game modes to help bring more options for draft modes. Oh and most of these changes are going into the live beta right now vs some dubious "future" release (take that as a lesson MtG Arena devs! ).